Has anyone not watched the Jumanji movie? I bet most of you movie-goers must have, given the fact that it was released on 21 December 2017 in Malaysia. As exciting as you might've thought it would be, this Jumanji is not anything like the old Jumanji in 1995 that featured our dear actor, Robin Williams. It is a brand new, all new type of storyline and 'Jumanji' system where there is no more board-game like Jumanji 1995, but a game console / arcade kind of Jumanji. The movie starts off with 4 high school kids getting detention and got punished removing staples from some stacks of papers. Then they found the Jumanji game and decided to play with it. Before they knew it, one by one of them started to get sucked into the game box and entered the Jumanji world. They then quickly realized that they have become the characters that they've chosen earlier. They met Nigel, one of the game's character who is sort of like the 'messenger' of the game. He only does and says what is 'programmed' of him by the game, he does not respond to questions. 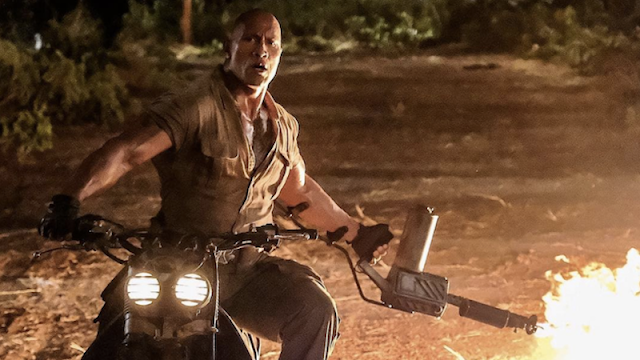 The movie also added a few more things to make Jumanji like a game, first is the set bar of lives on each character's wrists and the second one, is the ability to check one's strength and weaknesses. Kevin Hart's character, "Fridge" got the funniest weakness of all - cake. What happens when he eats cake? Well he will explode and lose a life. Third is the fact that every time a character dies, they come back alive, falling down from the sky with one life bar missing from their wrist. Their goal was to survive the game and return the jewel back to where it belonged. It was no easy task, for the game had traps, rhinos, steep cliffs, aligators, jaguars and panthers running after them. And the fact that Russel Van Pelt (by Bobby Cannavale) is hunting them down does not make it any easier. Apparently Van Pelt got hold of the jewel for selfish reasons and was consumed by it's powers. The movie did not really showcase much of his powers, apart from controlling the snakes at the end of the movie to stop Martha (by Karen Gillan) from getting the jewel to Spencer (by Dwayne Johnson) at the end of the movie. The movie was all funny the whole way through, and everyone else in the theatre thought so too - one notable one was a scene on Bethany (by Jack Black) who was turned into a professor-man and by the game and had to pee. 'She' asked Fridge (by Kevin Hart) to teach 'her' on how to do so and when she did, haha she was all over it and wished she could Instagram. There were people laughing pretty good in the theatre on this but I think the movie had stepped a bit on the line; it felt like the joke was too much prolonged and in the end the laugh felt not valid. Of course, no Jumanji is good without some jungle action! There were explosions, flying kicks by Martha, some motorbike action, street fight and of course, the legendary save by Spencer for Martha at the end of the movie. It can only happen in movies, no doubt a bout that, haha.